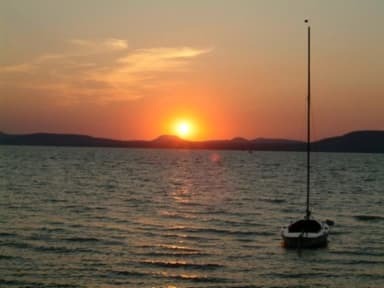 Balatonszemes is a very good choice in many aspects to spend the holidays. It's central location gives you many possibilities to reach easily and quickly the other villages and thermal baths in the neighbourhood and the northern side also. From the port very often leave ships to the sights of the northern and southern coast of the lake, you can visit the famous wine cellers at Badacsony or at Tihany or you can reach Kis Balaton to see wildlife or you can visit Siofok to enjoy the nightlife there. If you just want to relax, recharge yourself, engage in sports (windsurf paradise, bikeriding, horseriding, tennis) or fishing (a lot of karf, pike, catfish and other sweetwater fishes), you don't have to leave the village at all. 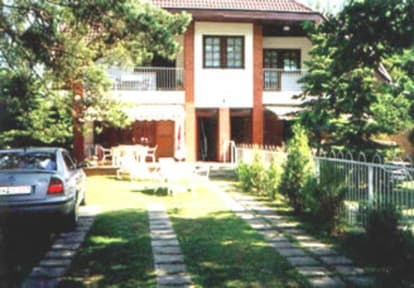 The house on the pictures can be found on the shore of Lake Balaton, opposite the entrance of the non-paying local beach. It's about 200-250 meters from the port and the center of the village, where the shops and entertainment facilities can be found. There are four apartments in the house, each has two balconies and a view to the lake. All flats are separated. Only the garden is shared where the cars can be parked. Each apartment is fully furnished and well-equipped. In the kitchen you can find a coffee-machine, toaster, microwave-oven, electric stove, fridge and all the dishes and spices. The bathroom is equipped with a tub and separated from the toilet. The living room and the 1-2 bedrooms give enough space for a comfortable accomodation. Sat-TV is also available in each apartment. On the balcony facing to the south and to the north you can relax, take the sun, dine and in the evenings it's a perfect place for long talking beside the wine-glasses. The shortest period to rent our apartments is five nights (5 nights).